DURHAM, N.C. — Starvation early in life can alter an organism for generations to come, according to a new study in roundworms. The effects are what Duke University biologist Ryan Baugh terms a “bet-hedging strategy.” In nature, the worms live a boom-or-bust lifestyle in which the occasional famine will devastate the population, but not all of the worms are killed. The survivors are smaller and less fertile, and they acquire a toughness that lasts at least two generations. What changes isn’t their genes themselves, but the way in which those genes are used, Baugh said. Baugh and his Duke team starved thousands of C. elegans worms for one or eight days at the first stage of larval development after hatching. When feeding was resumed, the worms that had starved longer grew more slowly, and ended up smaller and less fertile. They also proved more susceptible to a second bout of starvation. The starved worms also had offspring that were smaller, fewer and less fertile. However, these children and grandchildren of famine turned out to be more resistant to starvation and a heat-tolerance test. More of them were also male instead of the usual hermaphroditic, self-fertilizing form. In their natural conditions, it appears the worms are able to increase their growth rate and fertility in times of plenty and then to turn these traits back down in hard times. “They have a memory of famine,” Baugh said. The net result is “a combination of fitness costs and benefits that unfolds over generations,” the authors wrote in a study that appears early online in the journal Genetics. Thousands of the 1-millimeter worms were hand-sorted multiple times for the meticulous study. “Phenotypic analysis is a lot of work,” Baugh said. Though this study doesn’t yet identify the mechanism that controls gene activity for generations after a famine, the findings build a foundation to do so, Baugh said. The alteration of gene activity, called epigenetics, might result from modification of RNA molecules that interact with genes; a modification of the packaging that carries DNA; molecular switches attached directly to the DNA itself; or even something to do with the cell’s power-stations, the mitochondria, Baugh said. Whatever the epigenetic control turns out to be, it is clearly handed down across generations. The appearance of more males could be a stress response that ensures greater genetic diversity than could be obtained by the usual self-fertilization, Baugh said. For that matter, more “outcrossing” with males in the mix could also spread the epigenetic changes brought on by the famine experience, he said. 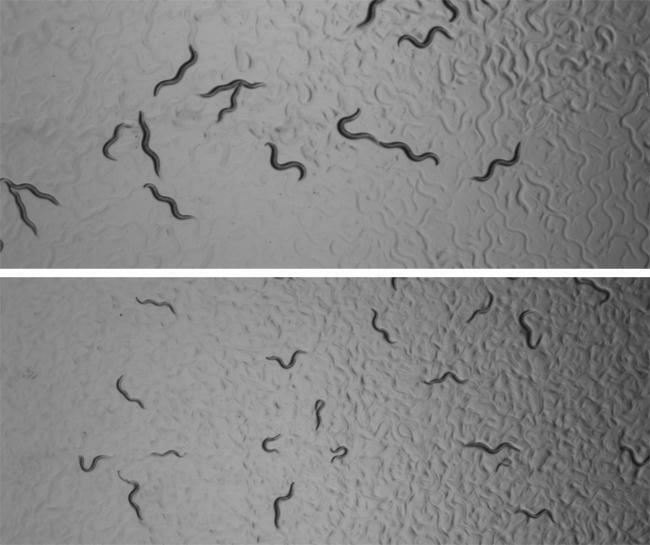 This study in a large number of genetically identical worms echoes a natural experiment that occurred in humans in the Netherlands during World War II. The “hunger winter” was a very cold period from November 1944 to the late spring of 1945 during which a German blockade forced the Dutch to survive on less than a third of their regular caloric intake. For decades afterwards, Dutch and British scientists studied the children who had been exposed to this famine in utero. These children grew smaller than the Dutch average and their children were also smaller. They also turned out to be more susceptible to diseases of metabolism including diabetes, obesity and cardiovascular disease. The hunger winter studies suggested there was an epigenetic change at work, but animal studies are needed to dig deeper into how it works, Baugh said. This study was funded by the National Science Foundation (IOS-1120206).